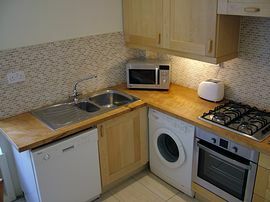 This stunning, and well equipped self catering apartment is ideally located for a break in central Edinburgh. It is situated in the prestigeous New Town of Edinburgh, the largest uninteruped area of Georgian architecture in Europe. The luxury flat is on the first floor of an elegant Georgian building, dating from 1850. 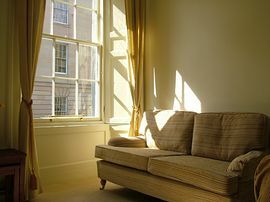 A particularly light flat, Cumberland Street is extremely quiet and so the flat is relaxing and quiet, and yet it is still just a few minutes walk from famous George Street and Princes Street. The Old Town is just 10-15 minutes walk. On the fringe of Stockbridge - a cosmopolitan 'village' which is steeped in history, and has endless bars, restaurants and unusual shops. 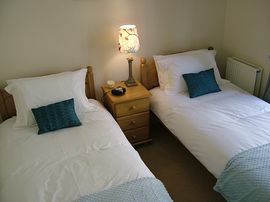 This is a perfect location for visiting all the sights of Edinburgh, whilst staying in the spleandour of the Georgian New Town. Bright, quiet and peaceful apartment. Local Services: Centrl location so car not necessary. But frequen bus service if require to travel further. Head for City Centre, and from George Street,turn left onto Frederick Street, and follow down the hill. St Stephens Church is at the bottom, and Cumberland Street is on the right just before you reach the church. 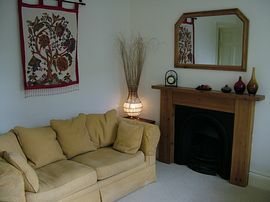 Prices from £80.00 per night, depending on season. Wekkly rates from £550.00 per week. 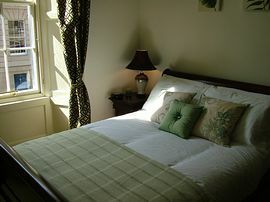 Special rates for 3 or more nights.